As someone who is looking for an herb grinder you desire one that can produce an even grind again and again, but also an herb grinder that has your sense of style. 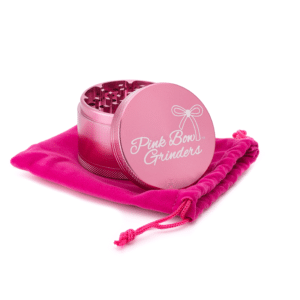 While most grinders seem to only consider what men look for in a grinder, Pink Bow Grinders was created with you in mind. The creators of Black Tie Grinders worked hard to meet the needs of female herb grinder users. With sophisticated styling and a gorgeous pink tone, Pink Bow Grinders encapsulates the quality and reputation of Black Tie into a whole new package. Now you have an herb grinder that is meant for you. But style is not all Pink Bow is made of. When you buy a Pink Bow Grinder you will get the same features that have made Black Tie Grinders one of the best selling grinder brands. 50 razor sharp diamond shaped teeth, a carefully crafted pollen filter screen, neodymium magnets to keep the lid on tight during grinding, and anodized aluminum that is not painted so it won’t chip or peel over time. Each Pink Bow Grinder is manufactured using CNC technology so each piece fits seamlessly. Lastly, we have a 100% money back guarantee on our grinders. If for any reason you find that your Pink Bow Grinder does not live up to your expectations please return for a full refund, no questions asked. When you use your herb grinder we want you to feel as special and unique as you are with Pink Bow Grinders.